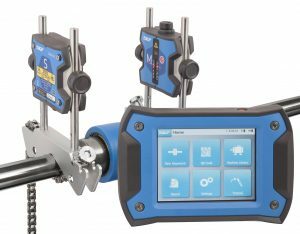 The TKSA 41 is an advanced alignment tool for achieving accurate shaft alignments. With two wireless measurement units, large sized detectors and powerful lasers, the instrument performs precise measurements in even the most challenging conditions. The ergonomic display unit with intuitive touch screen navigation makes your alignments fast and easy, while innovative features, like the “free measurement”, increase the alignment performance. With the focus on improving alignment practices, the TKSA 41 is one of the industry’s best value alignment solutions. Wireless communication improves instrument handling and allows alignments of difficult to reach applications from a safe position. Automatic measurement enables hands-free measurements by detecting the head position and taking a measurement when the heads are rotating into the right positions. Automatic reports are generated after each alignment. The reports can be customized with notes and pictures from the built-in camera for the most comprehensive overview. All reports can be exported as pdf files. Live view supports intuitive measurements and facilitates horizontal and vertical measurements. The simplicity of the TKSA 41 provides greater confidence for the performance of alignment tasks on all types of rotating machines. QR codes can be used to further simplify machine identification and improve the alignment workflow.